Our consultant will get back to you very soon with the most appropriate bookkeeping plan. We provide our services to local and multinational companies from different industries and of various sizes and complexity. Our process helps companies reduce costs by as much as 40% as compared to hiring in-house bookkeepers. 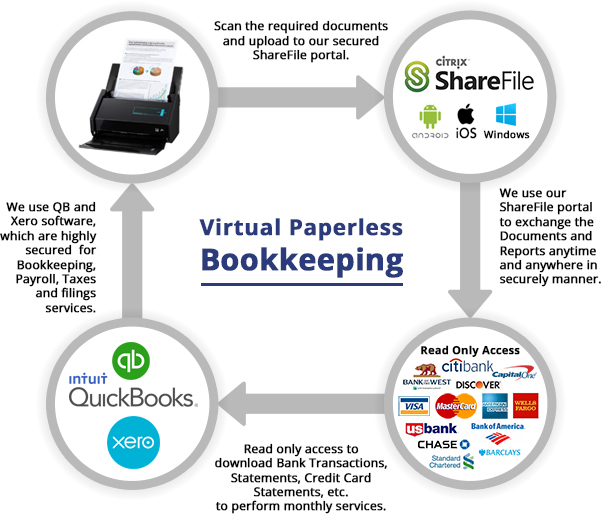 Virtual bookkeeping is totally paperless and online processing in which the accounts and financial data of an organization are managed virtually by an outside bookkeeper. We use QB and Xero software for bookkeeping that provides a highly secured platform for all type of services including file sharing, bank transactions. Allows us to be accessible and available to you, no matter where you are - on a business trip, out in the field, or in your office. As we have a wide range of experienced Accountants, you can deal directly with our CPAs as per your requirements. Rather than just data entry, provides you a well-planned and managed financial package monthly. So you can monitor the status of your business to take more proficient and better business decisions. Affordable bookkeeping fees, as we don't have a storefront. Communicate with us with by phone, email, online, as per your comfort, decide what style you feel better. Do you have a CPA or Tax Preparer? Are your tax filings and payments current? If no, when was the last fiscal year filed? What are your biggest challenges when it comes to the financial accountability of your business? How much do you can pay for bookkeeping services?